ABOVE: The Hotel American Dinesen's entrance is on the Fondamenta San Bragadin. INSET BELOW: The Rio San Vio, with the hotel on the right. Location: On the San Vio Canal in Dorsoduro, between the Gallerie dell'Accademia and the Peggy Guggenheim Collection. Closest Alilaguna Airport Boat stop: Zattere. You're obsessive about art museums, or you simply want a moderately-priced hotel in a quiet, fashionable neighborhood near the Accademia Bridge. The hotel has its own water-taxi pier, free Internet access, and a porter to haul your luggage up the stairs. The first satellite photo shows the Giudecca Canal and the Zattere (bottom), looking toward the Accademia Bridge and the Gallerie dell'Accademia (left), the Grand Canal, and--on the right--the Peggy Guggenheim Collection. The Hotel American Dinesen is just south of the Campo San Vio (center of photo, on the Grand Canal). 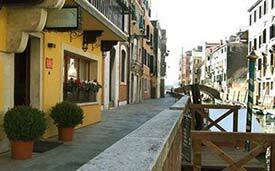 In the lower close-up photo, the Hotel American Dinesen is just to the right of the Campo San Vio and the footbridge over the canal.